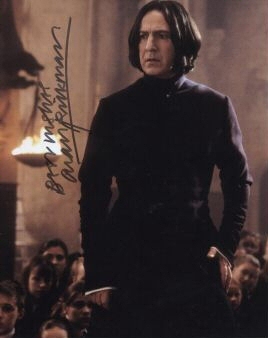 Alan/Severus' signed foto. collectible item from e-bay. Wallpaper and background images in the severus snape club tagged: severus snape alan rickman severus. This severus snape photo might contain bien vestido persona, juego, juego de pantalones, traje pantalón, persona bien vestida, traje, pantalones traje, pantsuit, pantalones de traje, prendas de vestir exteriores, overclothes, prendas de abrigo, ropa de abrigo, manchó, abrigo de la caja, and caja de capa. The man is simply beautiful. what was that thing written before "Alan Rickman?"